Here are the 8 most dependable and prolific meteor showers for Northern Hemisphere observers, and tips on when to watch and what you might see. The biggest problems for visual meteor observers are the weather, natural light pollution from the Moon, and artificial light pollution. The Moon is at least predictable, and I have listed the lunar phase and amount of interference with each shower below. 2018 gets off to a bad start with a bright Moon essentially wiping out the Quadrantids. The Eta Aquariids and the peak of the South Delta Aquariids are also lunar casualties. But we can enjoy this year's Perseids without lunar interference, and there are good Moon-free observing windows for the other major showers. Several factors determine how many meteors you will see from a shower. * One of the most important is the elevation of the shower's radiant when you're watching. For most showers, the radiant is highest in the morning hours, and that's when you can expect the best rates. If the radiant is near or below the horizon, don't expect to see any shower meteors even if the sky is dark. For each shower, I list a "WHEN TO WATCH" window when the radiant is at a useful elevation. The local times I list in "WHEN TO WATCH" should be broadly valid for most sites in North America, regardless of your time zone or exact location. You may want to look up the beginning of morning astronomical twilight for a given date at your location. This can be found from planetarium software or some weather websites. I find that skies are still good enough for meteor observing for 15-30 minutes after the beginning of morning twilight. * Clear, dark skies are essential for a rewarding meteor-watching experience. This is why the moon causes so many problems--it's just natural light pollution. Get away from artificial light pollution as best you can--don't expect to see many meteors from an urban or suburban location. The light wipes out the fainter meteors and makes the moderately bright ones less noticeable. Try to get to a location where the Milky Way is obvious on a summer night. Obviously, clouds are a deal-breaker as well. * The actual activity level of the shower has a big impact, of course. But I put it third on the list of factors because you have little control over it. The year's best showers generally have one night/morning that they are most active. The peak of activity may last for a few hours to many hours, but the exact timing is usually uncertain. Nevertheless, I list the "predicted maximum" time for each shower (based on past observations and the IMO Meteor Shower Calendar) along with conversions to Pacific and Eastern times. If the peak time occurs during your daylight hours (or during the night but before the radiant is high in the sky), pick the productive observing time that is nearest the peak (my "WHEN TO WATCH" gives suggestions). * Your personal visual perception and experience also factor into how many meteors you see. For best results, make sure your eyes are dark-adapted (don't expose them to any bright or not-so-bright lights for a half-hour or so before you begin observing) and that you are comfortable. Not all the meteors you will see belong to the major shower. Sporadic (random) meteors are visible every night of the year. From dark sites, 5 to 15 or more sporadics may be seen each hour. Sporadics are most numerous in the predawn hours, when the Earth is running head-on into a lot of cometary debris. There are also minor showers active at the same time as most major showers. Most of these produce 0 to 2 meteors per hour even at peak activity. When a meteor appears, make a note of its path against the stars. Hold a long shoestring or cord up against the sky at arm's length along this path. If you extend the meteor's path *backward* along the cord, does it eventually cross or come close to the shower's radiant? If so, the meteor was probably a shower member. If not, the meteor was not a shower member. The "radiant charts" show the position of the radiants in the sky, along with some simulated shower meteor paths. The paths are just examples, and they aren't completely accurate due to the projection required to display the apparent dome of the sky on a flat screen, but they should give you some idea of what to look for when you wonder whether a meteor is a member of a particular shower. 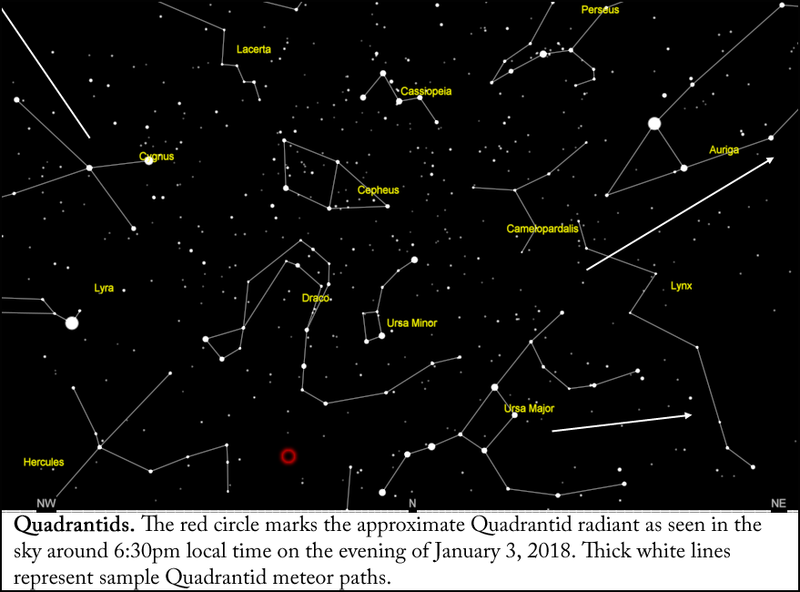 WHEN TO WATCH: The Quadrantids will complete with the bright, nearly-full Moon. Given that that Moon will be reflecting off snow in many areas, creating even brighter conditions, and that the nominal peak occurs during the daytime for North America, this year's shower is for die-hards only. The radiant is highest in the predawn hours, so if you watch then, plan for the morning of Wednesday, January 3rd (Thursday, January 4th in Europe and Asia). 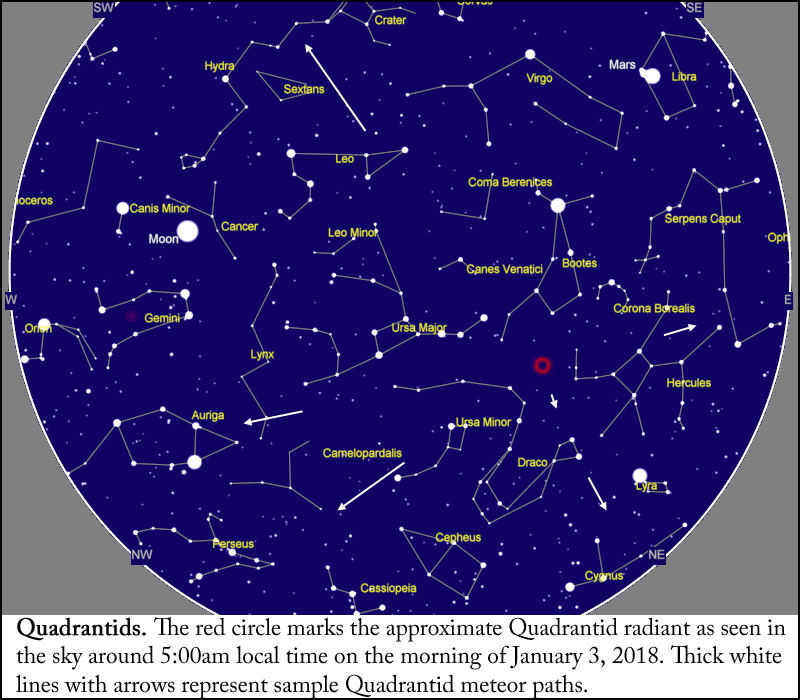 A few Quadrantids may be visible during the evening hours; some locations have a short moon-free period just after dusk on the evening of Wednesday, the 3rd (and a longer one on the evening of Thursday, the 4th, but the shower may be essentially over by then). Evening Quadrantids can be impressive earthgrazers, but they are rather few and far between. The peak of this shower usually doesn't last long, and is notoriously variable in strength and timing and duration. The weather is often horrible as well. The best peaks, such as in 2009, are impressive indeed and produce rates of over 100 per hour. Moon-soaked rates this year may reach 10-15 per hour. Quadrantids are medium-velocity meteors. The shower usually produces quite a few fireballs around the time of maximum activity. The radiant is in a rather blank area surrounded by the constellation figures of Bootes, Hercules, Draco and Ursa Major (see the radiant charts). WHEN TO WATCH: The morning of Sunday, April 22nd should be best for North America. Observers in Asia and Europe will likely do best on the morning of Monday, the 23rd. 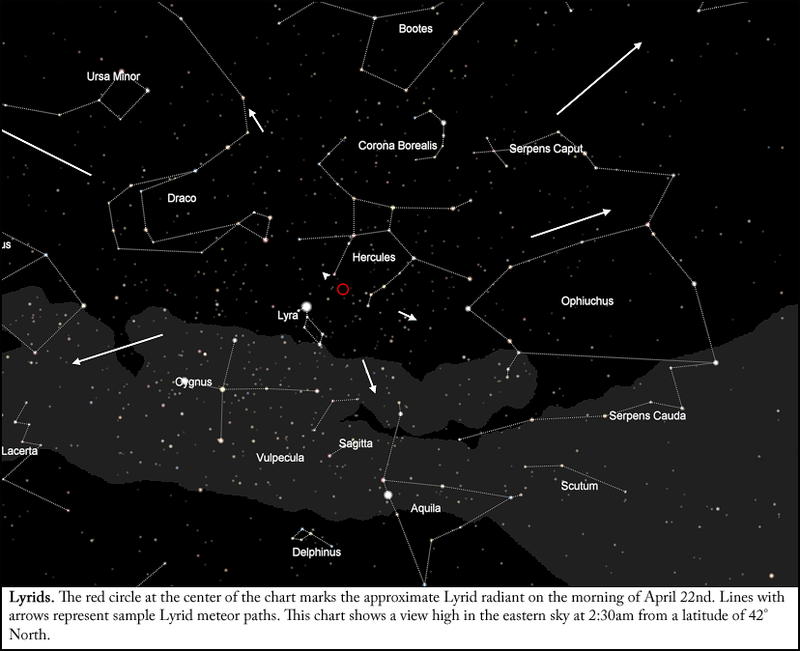 The last 2-3 hours before morning twilight will be moon-free, and the Lyrid radiant will be highest then. The Lyrids are a shower with a reputation for variable rates and timing. The predicted maximum time isn't great for North America this year. Usually, the Lyrids produce about 10-20 meteors per hour at maximum (under dark skies). The radiant is between the bright star Vega and the Keystone of Hercules. Lyrids produce fairly fast meteors with a reputation for being faint on average. However, I've seen my share of Lyrid fireballs. 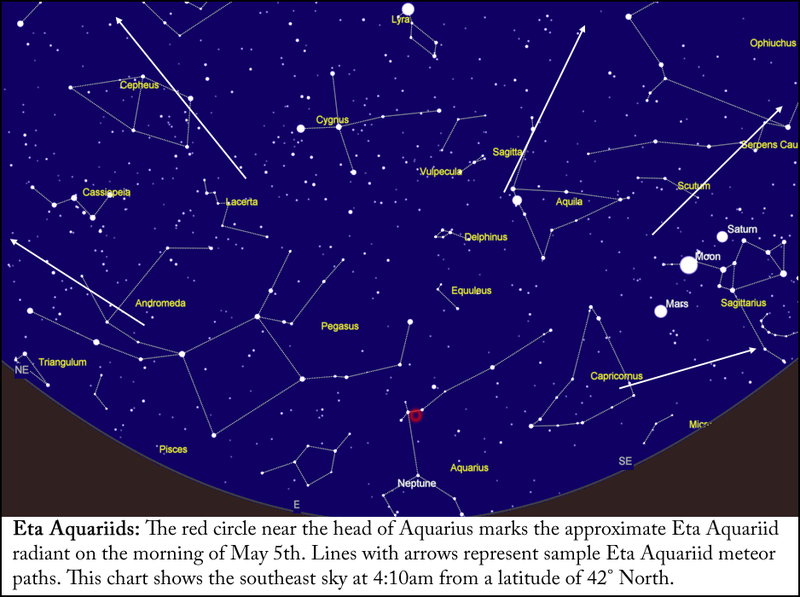 WHEN TO WATCH: The Eta Aquariids are only visible for a short period around the time morning twilight begins. The peak should occur on Saturday, May 5th or Sunday, May 6th, but the activity is broad. Unfortunately, a bright Moon will be present in the morning sky this year, so if you go out to watch, try to face north or northeast to keep the Moon (in the southeast) out of your field of view. Block the Moon behind an object such as a tree or building if you can. The key to seeing Eta Aquariids is to watch during the last bit of darkness and through astronomical twilight (see below for timing). The Eta Aquariids are better for Southern Hemisphere observers, but are a bit difficult for everyone. The key is to watch during the last hour or so before twilight gets really bright. In terms of local time this depends on your latitude and also on your longitude with respect to the center of your time zone. Check an almanac or planetarium software. At latitude 42.6 degrees North, I've had my best results from about 3:30-4:30am local daylight time. Observers from mid-northern latitudes will likely see just a few Eta Aquariids this year due to the bright moonlight. The low radiant elevation (in the "head" of Aquarius) means that the earliest ETAs you see will be "earthgrazers": long, relatively slow and often tracing paths along the horizon. Bright earthgrazers are spectacular. Unfortunately, because of their greater distance from the observer, earthgrazers tend to be faint. As the radiant gets a bit higher, the ETAs take on more of their typical appearance: fast meteors, bright on average and often leaving a glowing train. You'll only catch a few of them, though, because dawn is approaching. This shower seems to fluctuate irregularly, and you could easily hit either a spurt or a lull during the all-too-brief observing windows. 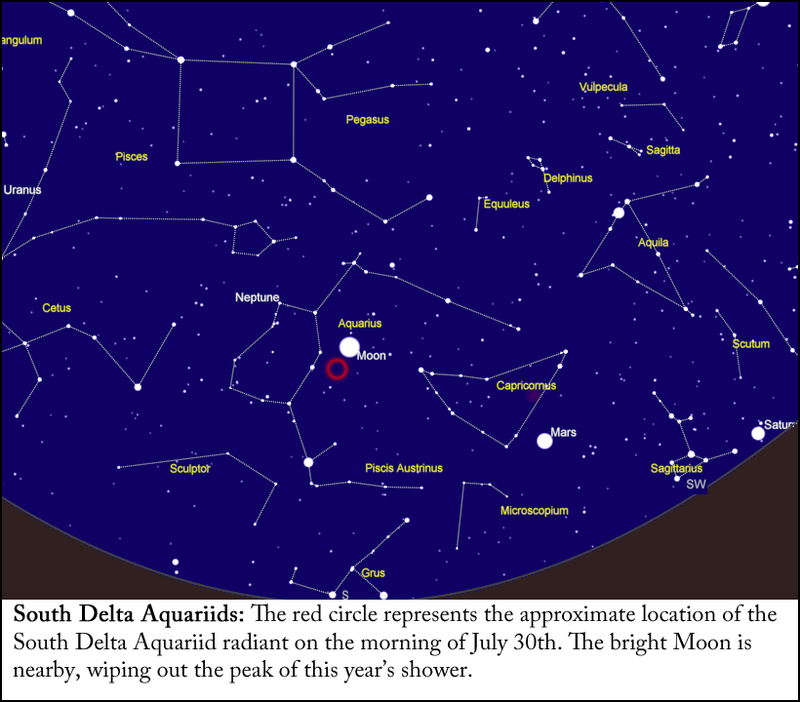 WHEN TO WATCH: This is a bad year for the South Delta Aquariids. The Moon will be bright and unavoidable during the peak activity period, and most of the meteor activity is faint, so there isn't any good time to watch. The silver lining is that bad moon conditions for the South Delta Aquariids always mean ideal conditions for the more-impressive Perseid peak two weeks later. The South Delta Aquariids are still active in early and mid-August, usually producing a couple of meteors per hour. The South Delta Aquariids are barely a major shower from 40 degrees N; southern observers have a somewhat better view. On a clear, moonless morning a North American observer might see 5-10 South Delta Aquariids each hour along with 15-25 meteors from other sources. Moonlight will drastically cut the rates this year. WHEN TO WATCH: Die-hard observers will always watch during the morning hours on the days around the maximum. The radiant is highest in the predawn sky, which means more meteors than in the evening. The peak night this year will be the evening of Sunday, August 12th through the morning of Monday, August 13th. Observers at dark sites will also see plenty of Perseids on Sunday morning, August 12th and Monday evening/Tuesday morning (August 13/14). Observers who plan an all-nighter for the peak will start watching as soon as the sky gets dark enough. This is about 9:30-10:00pm from mid-northern latitudes. Perseid rates will start out low, due to residual twilight and the low radiant elevation. On the other hand, the low radiant will lend earthgrazer characteristics to many of the early Perseids--long paths and persistent glowing trains. As the night goes on, the radiant climbs higher and Perseids will become more numerous. Meteor counts corrected for the radiant elevation and sky conditions (converted to ZHRs) may reveal the time of the shower's maximum activity, but there should be lots of Perseids visible all night long. The Perseids are probably the most-watched annual meteor shower. The shower has a very long duration, from about July 15th through August 25th, but is most interesting around its peak on August 12th or 13th. In recent years, the exact timing of the peak has varied somewhat from the predictions. So don't cling too closely to the "predicted maximum" time above; just go out and watch on August 12/13. A slight variation in peak timing might give you a bonus or a slight disappointment, but as long as you are watching from a dark site with good sky conditions you will see lots of Perseids. Typical rates from an ideal location on the morning of August 13 could reach 60-100 meteors per hour. As with all meteor showers, this does not usually mean a regular, clockwork drip of one meteor every minute; rather, expect lulls of several minutes without activity interspersed with flurries of several meteors in a minute. Perseids aren't the only meteors out there--there are minor showers (including leftover South Delta Aquariids) and random sporadic meteors. These "extras" can add quite a few meteors to the total seen from dark sites; since sporadics are fainter on average than the Perseids, fewer are visible from light-polluted sites. 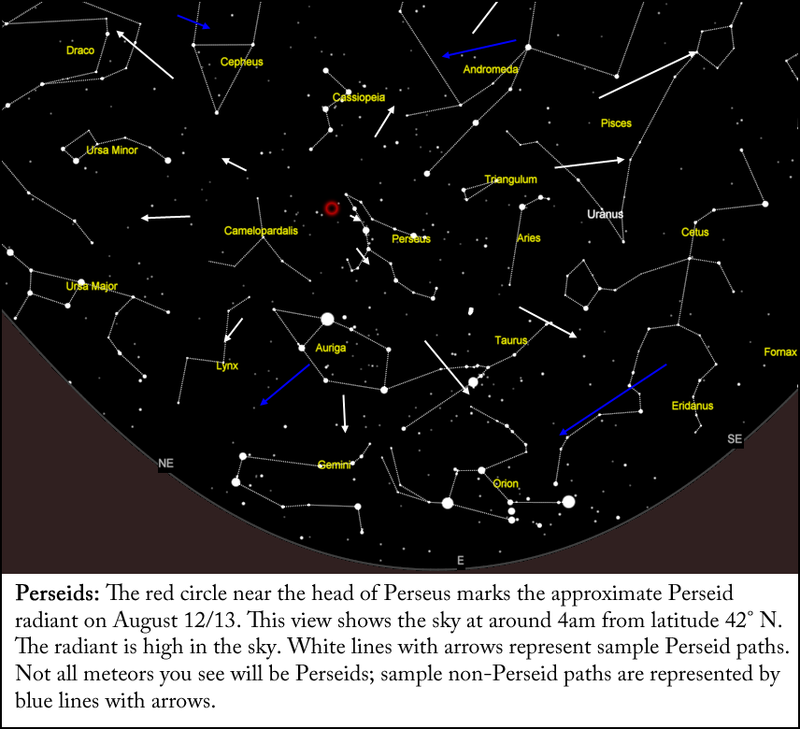 Even casual observers have the chance to pick out some obvious non-Perseids that can't be traced back to the head of Perseus (see the morning radiant chart). 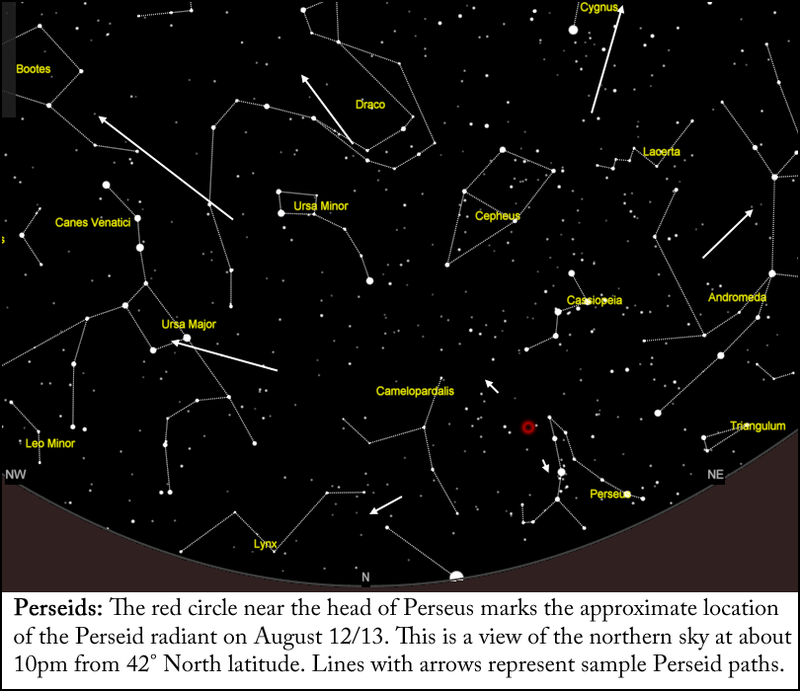 The Perseid radiant is above the horizon the entire night for observers north of latitude 32N, but it is fairly low at the end of evening twilight. Perseids are fast meteors and tend to be fairly bright on average. This combination means that many Perseids will leave a glowing wake or train behind that persists anywhere from a fraction of a second to many seconds. Expect to see a few fireball-class Perseids (as bright or brighter than Venus), especially on the morning of the 13th. I watched the Perseids from August 10th-13th at the Oregon Star Party in Central Oregon. Rates on the 10th and 11th were below normal; my peak hours had 23 and 22 Perseids respectively. Rates picked up on the 12th; I averaged 65 Perseids/hour on that morning. The 13th was slightly better; in my last hour of observing just before morning twilight I counted 77 Perseids and 99 total meteors. 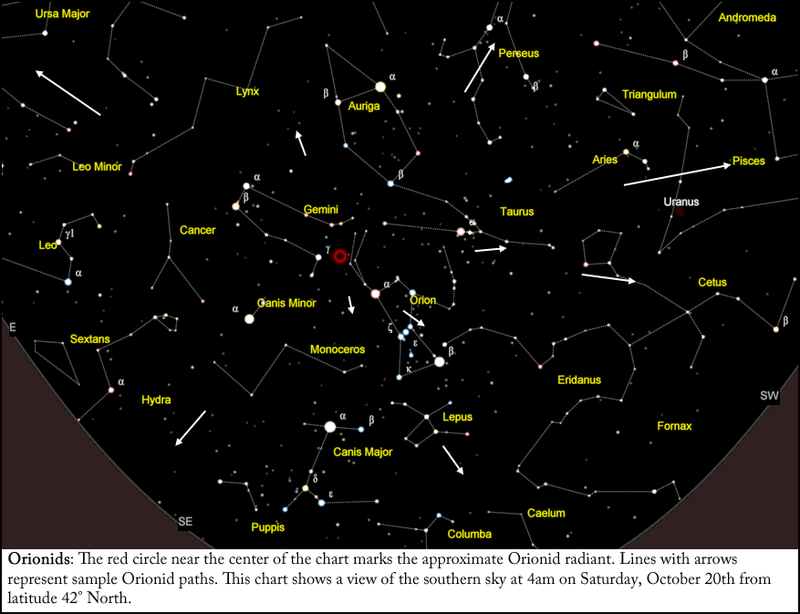 WHEN TO WATCH: The Orionids are capable of producing interesting activity from October 17th through the 25th. Traditionally, the shower produces maximum rates of about 25 per hour, with occasional enhancements to 50 per hour occurring irregularly. The shower's activity is unpredictable; often one morning (perhaps even the nominal maximum of October 21st) may be dull while another morning during the activity period is very active. I never know what to expect from this shower. Watch on any morning between Thursday, October 18th and Sunday, October 21st. On the 18th, the Moon sets at around 1am for mid-northern latitudes, leaving the rest of the morning dark for meteor observing until morning twilight intervenes. The Moon sets later each morning thereafter, cutting into the dark sky time. My location gets about 2 hours of darkness on the morning of the 21st, and an hour on Monday, the 22nd. The Orionids are fast meteors, perhaps a bit faint on average but the shower has some larger meteoroids capable of producing fireballs. As with the Eta Aquariids, the Orionids are debris associated with Halley's Comet. Note that the radiant is north of Betelgeuse and not right in the middle of Orion (see the radiant chart). The Orionids are joined by several minor showers (the Taurid complex, the Epsilon Geminids, and the Leonis Minorids) that each typically produce 1-2 meteors per hour. I went out for 1.75 hours just before the beginning of morning twilight on October 20th and again for the same amount of time on October 21st. Activity was almost the same each morning, but Orionid rates were rather low. I saw 28 Orionids and 23 other meteors on the 20th; 29 Orionids and 23 others on the 21st. I didn't see any fireballs. WHEN TO WATCH: The mornings of Saturday, November 17th and Sunday, November 18th bracket the "traditional" maximum of the Leonids. Watch from about 2am until morning twilight begins. The Leonids are well-known for the spectacular storms they have produced in the past. Nothing like that is predicted for this year, and during off years the shower can be marginal, producing about 10 meteors per hour. However, there's always a chance that the shower will be more (or less) active, and bright Leonids are beautiful in any case. The Moon will set before the radiant is high, leaving the prime morning hours with good dark conditions. There is a possibility for some enhanced Leonid activity away from the normal maximum nights this year, but it will probably be minor. See the International Meteor Organization's 2018 Calendar for details. The Leonids are very fast meteors, and brighter ones often leave glowing wakes or persistent trains. I watched for meteors on the morning of the 17th and the morning of the 18th. On the 17th, in 2.2 hours, I only saw 10 Leonids. Overall activity was better, as I also saw 30 sporadics, 9 North Taurids, and 2 November Orionids. Leonids were more active on the 18th. I saw 20 in 1.8 hours, along with 17 sporadics, 4 North Taurids, and 2 November Orionids. WHEN TO WATCH: IF your weather allows, this is an excellent year for the Geminids! The morning of Friday, December 14th is the "main event". Enthusiastic observers in mid-northern locations will start watching on the evening of Thursday, the 13th, although the thick crescent Moon will be a slight hindrance for the first few hours of the evening. The Geminid radiant is rather low then anyway, further depressing rates. The Moon sets well before midnight, and from then until morning twilight the show should be in full swing for everyone. The morning of Thursday, December 13th should also be quite productive, with rates typically close to half that of the peak morning. The evening of Friday, December 14th may also be worth watching, with a couple of caveats. 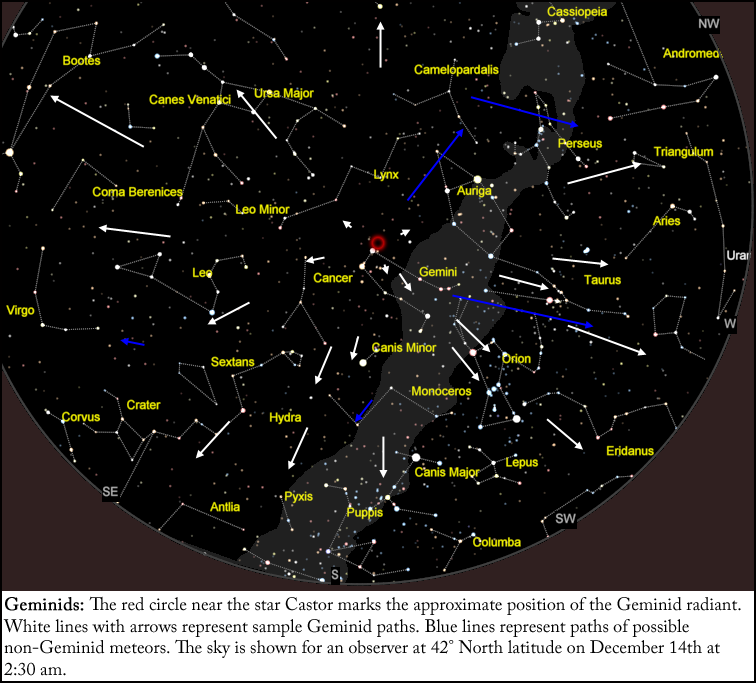 Geminid rates fall off rather quickly after the peak, but with a surge of bright meteors. Your experience will depend on your location and the vagaries of this year's shower. The Moon will also be more of a problem on Friday evening. The Geminids show a broad peak that is somewhat variable in timing. This is often considered the best annual shower, especially in locales where winters are mild. If the peak occurs during nighttime hours when the radiant is high, 100+ Geminids per hour are a definite possibility under dark skies. More often, wintry weather conditions intervene. You can watch a buildup to the peak for several mornings beforehand (usually about 20 Geminids/hour on the 12th and 40 Geminids/hour on the 13th). After the peak, rates usually drop precipitously (down to perhaps 10-20 per hour on the morning of the 15th). Geminids are medium-speed meteors. Most of them don't leave glowing trains, but the brighter ones are often colored (yellow, green and blue are most common, and I usually see some fireballs with a violet tinge). The Geminids seem to produce quite a few fireballs, especially during and just after the peak. Pre-peak Geminids are fainter on average. Skies were cloudy most of the week, and then initially clear but hazy on the evening of the 13th. I got in one solid hour of observing and saw 32 Geminids and 5 sporadics. After that, clouds intervened and ruined any chance to record formal data. Watching casually, I saw 52 Geminids and 4 sporadics over another 1.4 hours under conditions ranging from mostly clear to mostly cloudy. The major showers listed here are fairly reliable and occur every year. However, meteor activity is visible on any clear night. Random sporadic meteors, minor showers, and major showers near the beginning or end of their activity period all contribute to this "background". For the Northern Hemisphere, there is a general pattern of lower rates during the first half of the year and higher rates during the second half, but rates vary greatly from hour to hour, day to day, and observer to observer. Occasionally, unexpected high activity occurs. It is up to the observer to objectively describe what was seen. In many cases, high activity may be ascribed to randomness. Rarely, many of the meteors seen may be members of a periodic or previously unknown shower. The Draconids are a periodic shower that produced a couple of major storms in the 20th century. The parent comet of the Draconids, 21P/Giacobini-Zinner, will visit the inner solar system this fall. This might be correlated with higher Draconid activity, but more-refined models of the stream of meteoroids suggest that rates will be low. The models predict a peak at around 0h UT on October 9th (equivalent to 5:00pm PDT or 8:00pm EDT on Monday, October 8th). It is likely that there will be some Draconid meteors visible on Monday evening, especially in Eastern North America and Western Europe. Rate predictions are very uncertain; there could be just a few per hour, or we could be pleasantly surprised. Draconids are very slow meteors; the radiant is near the head of Draco and is highest in the evening hours. New Moon this year will be a great benefit to Draconid watchers. The Draconids did produce an outburst at the predicted time, with ZHRs briefly approaching 200. The timing was best for Western Europe and Eastern North America. It was cloudy for me at sunset and I didn't get to clear, dark skies until 8:30pm, 3.5 hours after the peak. Activity was dropping rapidly; I saw 10 Draconids in my first hour and only 1 in the next hour. The Taurids are a complex shower associated with debris from Comet Encke. They are active for much of October and November and usually produce a few meteors per hour. In some years, higher rates and a large number of fireballs are reported. Nothing of that order is predicted for 2018, but when you are out watching the Draconids or Orionids or Leonids, you will likely see a few Taurids. 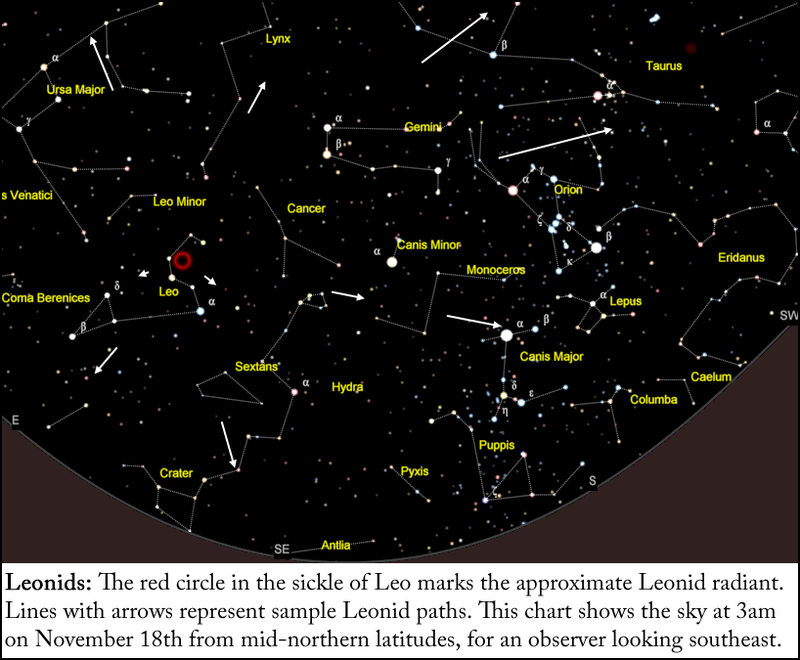 See the IMO Meteor Shower Calendar for more info. What the Heck is a ZHR? General shower attributes and predicted times of maximum are adapted from personal data and also from the International Meteor Organization's 2018 Meteor Shower Calendar. Recent data at http://www.imo.net/members/imo_live_shower was also examined. Radiant charts were produced using maps from the free Cartes du Ciel application. All on-site text and contents are Copyright 2017 by Wes Stone and may be reproduced for not-for-profit use so long as credit is given.